Did the East End guys recognize you? Nope! But how would they? It wasn't the guy(s) that are usually there, it was some new to me people. Maybe they can recognize me from/for my zest for good beers. those pac-man pellets were painkillers! Cool- I had heard about this from several people and had missed the visual (the part I really car about) for the post before. Maybe you mention it but it's not so clear whether you run to these parts of town to begin your "street goals" or drive out to them to begin... I'm also surprised that your map seems to suggest you only run within the neighborhoods that are blackened, which I'm willing to guess is not the case. Have you considered changing the colors of the routes rather than general sections one at a time? I'm not sure how interested you are in generating some sort of audience for this project, but it would be nice to see a few neighborhoods slowly eroded to make the bit by bit approach to completing some neighborhoods more apparent. After all, it is amazing b/c it's a human effort and more detail in your mapping would highlight that. Darkened means I've done all the streets in that neighborhood so it has been dispensed with. It's hard to see progress otherwise at this point, because mostly I am missing a small street here and there rather than some kind of large grid area. 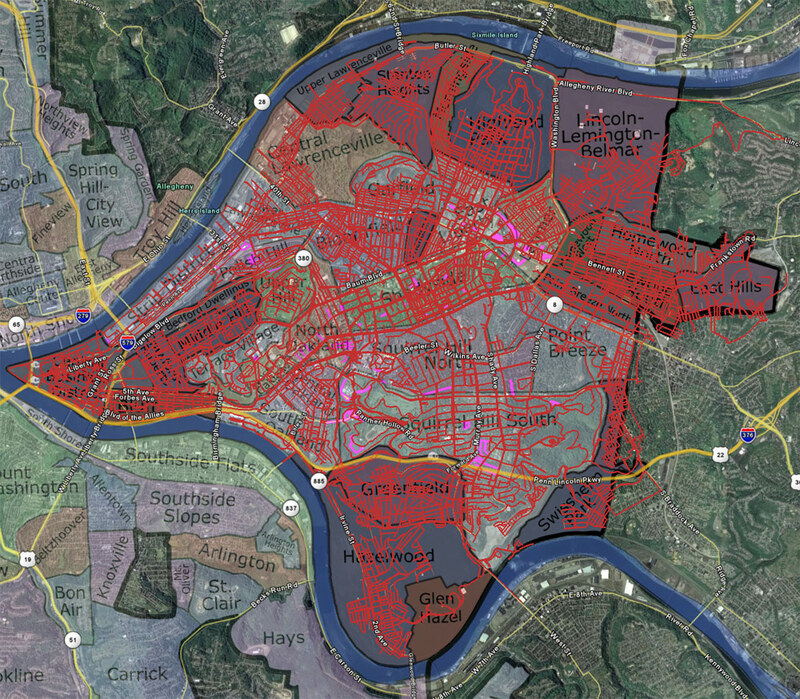 The short-term goal is to finish all of the neighborhoods on this side of the rivers ("continental Pittsburgh"), which is about half of the area of the city proper. After that I'll try to finish the whole thing. I always either start or end a run (usually both) at my house, CMU, or maybe someone else's house if I stayed the night. Occasionally I'll grab a ride somewhere or hoof it home from the Waterfront or something like that, but I'd consider it cheating to drive out in order to run a section and then drive back. I have some ideas for visualizations of the data, like coloring each route differently or plotting elevation vs. distance to show the route and start point trends and distances, but I think I'm kind of saving these as a reward for finishing the first phase. I'm getting really close now... if it weren't for the Great Race and training and travel I'd expect to finish by the end of the month. I completely agree: the maps are the essential way for people to understand what it's about. Do you like get lots of free maps now that you work at Google? Google make lots of maps. Free maps for everybody, yay!